snack with a kick - real cashew lover delight. 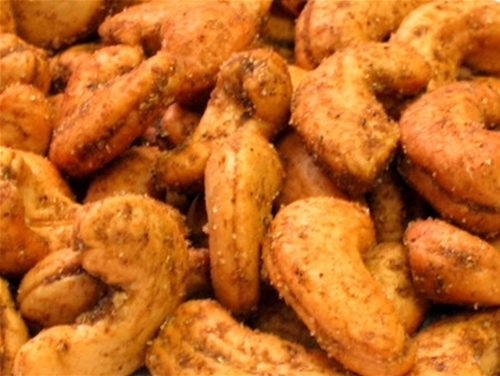 We have created a flavorful crunchy and spicy cashews (size #320) with a special blend of rich Indian spices. The texture, taste, and the aroma have to be experienced to be believed. Biting through the delicious spicy coating reveals rich and creamy center which is sure to make taste buds tingle with each mouthwatering cashew. Indulgence with these are known to spoil a loved one. You just can't stop with these really big cashews and if you like exotic spices, go no further and order today. Ideal for any occasion, perfect with beer and or wine. Order it today to keep in your fridge.